If you have little time to spare but still want to find the best sounding tambourines on the market, here you will find the model you need. After examining the quality and value offered by each product in this line and after reading the most popular reviews of tambourines, we concluded that the Remo Fiberskyn is the one you should consider. This is an affordable unit that features a pre-tuned imitation skinhead that plays exactly like a natural skin head. It offers the advantage of a more durable and lightweight instrument without sacrificing the great sound you would expect from a quality model. What’s more, this variant allows for an easy sanitation which is especially useful if you buy it as a gift to your child. If this model is not available, we recommend you consider the YMC Half Moon instead. This instrument is created with the needs of a beginner in mind. Suitable for players that are 12 years old and up, it comes with a construction that ensures its ease of use, while, at the same time, keeps the costs of its production to a minimum. The imitation skin head comes pre-tuned, and it is lightweight and easy to carry around compared to a genuine model. The tambourine is easy to clean. The double rows of metal jingles can make it sound a bit too bright. An excellent solution for anyone looking to start playing the tambourine. In case you have been looking around for a tambourine with a different design than those that come with a skin head, this half-moon model is right up your alley. It is easy to hold with one hand, while you play with the other, and making the 20 metal jingles produce the sound you want is comfortable, too. The model is made from hard plastic that is resistant to wear and tear, so this tambourine is a durable model. Some issues with the handle screws coming off were reported by some buyers. A half-moon tambourine that produces a rich sound you’ll like. This small tambourine is an excellent pick for small hands, so you can teach your children how to play, too. The head is made from real calf leather so you can expect superior quality to other models available on the market. It is easy to grip, and the rounded edges ensure that the player will experience no discomfort while practicing. For any young player, this could be a great tambourine. The sound could be better and not so tinny, some buyers say in their reviews. A small tambourine made with real calfskin and well designed. If after prospecting the market you are still having difficulty in finding a good tambourine to use together with your awesome electronic drum set, we have you covered. We have analyzed tambourine reviews, consumer reports, and surveys to create this list of top-rated and critically acclaimed products. Take a look below to learn more. The Fiberskyn instrument features a classic warm sound that comes in a lightweight traditional design. The amazing sound that this unit creates goes well with any other instrument, from your classic Yamaha violin to your beloved acoustic electric guitar. You can play it together with your friends and their different instruments as you are guaranteed to have the time of your lives. The construction features an Acousticon shell and a pre-tuned Fiberskyn drumhead that has a double-row eight jingle set. The pre-tuned imitation skinhead plays just like a natural skin head with the added advantage of being much more durable and lightweight. This means that you will be able to enjoy the kind of quality and sound you would expect from such an instrument. To make things even better, this is an affordable alternative which means that it can be a great gift for a kid or any person that loves music. The YMC variant is a fun little instrument that seeks to satisfy the users that don’t want to invest a lot of cash for their purchase but still want a tambourine that plays and sounds great. Whether you are an amateur player or you simply want a spare instrument to take with you when you’re traveling, we believe that this is a worthy pick. All it takes to convince yourself of the quality of this option is to take a quick look at the overwhelmingly positive reviews that customers left. The users that tried this unit were impressed by the bright sound that it creates and the quality construction that it boasts. For such a low price, it is hard to find a similar alternative on the market. The body is made out of durable plastic with an ergonomic grip that makes using it a pleasure. The jingling sound comes from the 20 metal zils that are as sturdy as they look. The Latin Percussion CP378 is an excellent pick for anyone who wants to get the hang of an instrument that is easy to play and a lot of fun, at the same time. It is an 8-inch model, so not particularly pretentious, but it offers enough ‘hitting’ area so that you can enjoy playing at it to your heart’s content. Young players, in particular, will find it an incredible instrument, as the overall design is created with their needs in mind. First things first, this is a small tambourine, so it is easy to hit by small hands. The shaped grip, along with the rounded edges ensure that there will be no danger of a player getting hurt while using the tambourine to learn the instrument or when having fun. While you may feel tempted to think that this is not a real instrument, the headed design and the calfskin heads, with solid wood shells will prove you wrong. This Remo unit features the well-known classic warm sound that is found in the lightweight traditional design which artists love. It is constructed with an Acousticon shell and a pre-tuned Fiberskyn drumhead. It features a double-row eight jingle set that produces a powerful sound to help you stand out in any orchestra. If you are on the lookout for a tambourine for church, this is one worthy option as the customers that have tried it can attest to its quality both in terms of sound and the quality of the construction. If other options made from plastic, and other types of skin can break easily, things are different with this unit. The Fiberskyn is incredibly strong meaning that it can take a beating, and you won’t have to worry that accidentally dropping the Remo TA-5210-52 will damage it. To make things even better, this is also incredibly lightweight which makes it easy to carry and use. Want to try playing the tambourine, but you are unsure if it is worth to pay a lot of cash for something that you are not certain you are going to pursue? You won’t have to worry anymore as this extremely affordable unit will give you the chance of purchasing a functioning instrument that sounds amazing with just a few bucks. The YMC TAM20-BLACK uses a beautiful half-moon design that plays not only a visual role but also a practical one. The design makes a lot of room for your hand so that you can have a comfortable grip on the instrument. Playing for long sessions is not a problem as using this instrument is accessible even for the amateur artists. You get a total of 20 jingles, and the use of a double row of jingles further improves the quality of the sound. The plastic construction uses only heavy-duty materials that can guarantee a long life and the capability of withstanding heavy use. Want to spark your children’s interest in playing an instrument? Getting the Remo Radiant is a worthy choice as it is an affordable unit that offers great quality and sound. Indeed, the first thing you’ll notice the moment you set your eyes on this model is the fun and colorful design. 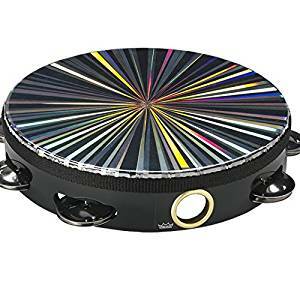 This incredible model has an iridescent colored head that does not only bring style to playing this tambourine, but that is also guaranteed to make you or your child the star that everybody will look at. Your kid will sound and look cool as it beats and shakes the head with his or her hand or leg. This is also incredibly lightweight which makes it easier than ever to take it with you everywhere you travel. If large instruments such as a trombone require their very own sturdy trombone case, with this model you can just place your instrument in your backpack, and you are set to go. The Meinl Cymbals tambourine mounts securely to any hi-hat stand pull rod, and it can deliver a bright jingle accent whenever you close or open your hi-hats with your foot. This makes playing this amazing instrument that much more natural and convenient allowing you to use it in a band so that while your friends play their guitars and awesome electric ukuleles, you can play the drum and tambourine. The secure hardware assures that you get a solid grip as well as an easy access wing nut that facilitates a quick set-up, removal, and adjustment, completely independent of your vibrant cymbals. The Meinl alternative remains quiet as you play on your hi-hats with a stick. This ensures that you only get the sounds that you want. When you wish to add a tambourine effect, you can start using the hi-hat pedal or simply strike it with a stick. The eight pairs of steel jingles respond by offering a light and bright sound. The RythmTech unit offers a look and feel that is familiar to every musician. It maintains the classic look that tambourines have had for decades and it provides the same vibrant and warm sound that we all associate this amazing instrument with. The cushioned grip absorbs any excess shock from your performance so that you get a clear sound that is a joy to listen to. The nickel jingles add the same kind of sound to your rhythms that you can get from high-quality tambourines. All that while paying a fraction of what other manufacturers ask for this kind of performance, so you get great value for the money. What’s more, the molded comfort grip handle will enable you to play for longer without feeling uncomfortable or tired. The customers that have tried it have reported that this option is great for recording as the sounds it produces are very clean. As the name implies, if you are looking for a cheap tambourine that can offer quality and features that can rival with more expensive alternatives, the Romo Economy is a choice we recommend. It features eight pairs of jingles on two rows with a Quadura black finish that gives it a stylish look that goes well with any outfit. This unit can produce a professional-quality sound, and even if its name may say “economy,” the music that it creates knows no boundaries. It was designed with professional players and drum enthusiasts in mind in order to create a stunning performance. A perfect pitch is guaranteed every time due to the use of a white film and two rows of jingles that surround the body. The metal band that surrounds the thumb hole is smooth and helps increase the musician’s comfort and his or her ability to play as long as he or she desires. This foot tambourine is deal for Cajon and guitar players as it can elevate the sounds that you create to a whole new level. The durable high-impact plastic frame is designed to handle heavy use and abuse, meaning that you won’t have to worry that dropping it would render your new acquisition unusable. It also comes in a beautiful red color. The patented jingle pinning system will keep your jingles in place no matter which way you move them around. Even if this is an affordable purchase, Latin Percussion has done its best to provide the user with an experience that is on par with what more expensive alternatives offer. The four pairs of nickel-plated steel jingles offer a bright and high-projecting sound. The elastic band will fit comfortably over your foot so that you can wear it for as long as you wish without feeling uncomfortable. With the Meinl Percussion FJS2S-BK, you will be able to complement virtually any instrument as the sound that it creates is not overpowering. This is a light and versatile product that can deliver a sensitive accompaniment to an entire orchestra. It is especially favored to be used with a Cajon. It is easy to use and take on and off due to the durable elastic band. This elastic band will allow for an easy slip on the foot. The ergonomically curved Rubber Wood body and the strong nylon elastic strap will ensure that the instrument will stay safely secured on your foot as you play. For artists that are always on the go, the Meinl Percussion model will add new layers to your grooves and liven up your songs without having to sacrifice much space in your gig bag. This tambourine measure 4 inches across and is only 2.75 inches high. The Meinl Percussion CFT5-BK is another affordable option from this respectable brand, and it boasts a sound that is precise and a design that is catered more toward Cajon players. The jingles are mounted facing up, and with a single tap of the foot, you can release a dynamic sound. You can use light taps to create resounding accents, even while sitting down. The five pairs of stainless steel jingles are mounted on a Rubberwood body that is durable and musical. This ensures that the body will not interfere with the sound created by the jingles so that you can enjoy a performance that is perfect for recording. When it comes to fitting this tambourine on your foot, things are as simple as they get. The sturdy hook and loop fastener will make putting the instrument on an effortless task. The fit is also comfortable so that you can play for as long as you are required. Finding the best tambourine for your needs is a process that takes a lot of time and energy. You can’t afford just to choose the first product that comes your way as this is an easy way of making a wrong decision that you’ll end up regretting. The best way to tackle this problem is to do proper research and take a look at the features that each instrument offers. Because not everyone has the kind of time on their hands that allows for in-depth research, we have decided to do the homework for you. We have read what other customers, as well as professional musicians, had to say so that we can pinpoint the features and criteria that need to be considered before you purchase one of the tambourines for sale. Take a look below if you want to find out more. If you are still unsure why you should learn to play the tambourine or you simply need a little push to purchase your first tambourine, we have gathered a few reasons why people learn to play this instrument; and why you shouldn’t let anything stop you. It might come as a surprise to some people that the most common place where the tambourine is played is the church. The reason why the church choir is the place that uses this instrument the most is that it goes well with any tune, and the rattling sound that the best tambourines for church create is very fitting for this purpose. If being in the church choir is not up your alley, you certainly had the dream of being in a band. If you never got to make that dream become a reality, getting a tambourine is a great first step. Playing along with an instrument can make you feel a part of something, and the best thing about this nifty model is that it is incredibly easy to use. It’s true, you don’t need a lot of skill to play this instrument, you might need lots of hours to master it completely but if you just want to have fun and play along in a band or even a church choir, there’s no better way to do it than by picking your first tambourine. The classic tambourine is an instrument that consists of a frame that is often made of wood or plastic with small metal jingles that are called zils. It is one of the oldest instruments known to man, and it has suffered few modifications across the millennia. 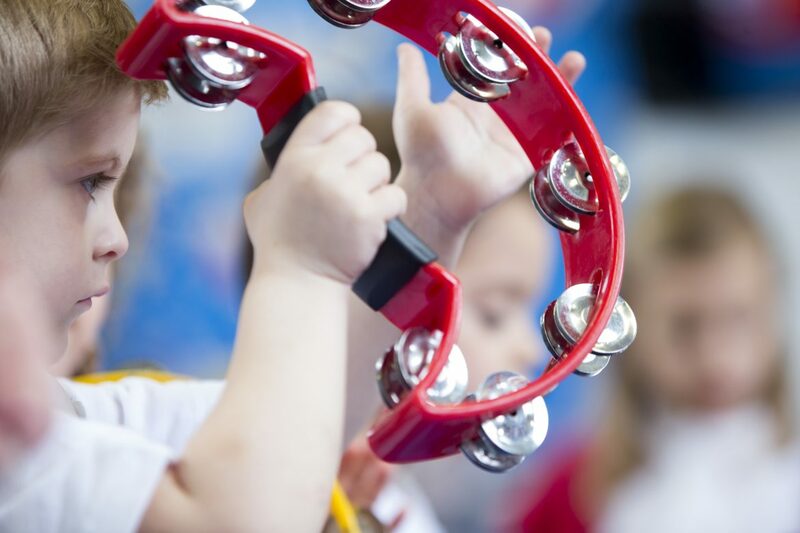 While a tambourine is certainly not a toy, its simplicity and ease of use can help you engage in fun activities with your child. You can inspire him or her to love music from an early age. There are also many fun games and songs that involve the tambourine. To make things even better, you won’t have difficulties finding an affordable option as most classic tambourines are quite cheap, especially when you compare them with instruments such as guitars and violins. By paying a low price, you can build a foundation for your child to pursue playing a musical instrument in the future. While most tambourines are used with the help of the hands, there is one type of instrument that is used mainly with the feet. The foot tambourine can be used hands-free, and it can accompany any instrument, but it is best used together with a Cajon. The foot tambourine is a great choice if you want a richer experience as it allows you to get the jingle sound with your foot while playing other instruments with your hands. It is exceptionally easy for beginners as you merely have to tap to the beat and start when you feel comfortable and ready to. You should also know that if you intend to use your instrument for recording purposes, not all tambourines sound the same on tape. For this purpose, you need to either go with a high-quality tambourine or search for the models that have the manufacturer’s stamp of approval to use for recording. Unlike other instruments, the size of your tambourine makes little difference in how it sounds, but it is still a feature that needs proper consideration. If you want to purchase a unit and use it yourself, and you are an adult, you should go for the 10 inches diameter option. This size should make it easy for you to grip and play comfortably. If you want to get a model for your child, then it is recommended that you choose an 8-inch variant. This size should be just right for him or her as it is much easier to handle by small hands. When the time comes to consider the type of membrane, there are two options available. You can either go with the natural membrane which is made out of calfskin, or you can choose the synthetic one, that is usually made from plastic. You shouldn’t worry that choosing one instead of the other will have a significant impact on the way you sound. The synthetic one is built to imitate the natural one. The one thing you should know is that the natural option is more expansive. If you took the time to look at some of the models available on the market, you probably noticed that some units come pre-tuned while others are not. What this means is that the ones that are not pre-tuned must be adjusted manually. If you are a beginner, tuning your instrument is not exactly something that comes naturally. It is also much more convenient to get the pre-tuned version. Another difference between various types of tambourines is the number of rattling discs they have on each row. Some units come with a single row while others offer a double row. If you want to emphasize the rattling sound, you should go for the double row. If you want a more discreet sound, the standard option should work just fine. Choose what works best for your needs. If you want to get more for your money, getting the Meinl Percussion pack is a great way to start. You get three instruments for a low price which is why this is a pick that customers love, as apart from a tambourine, you also get an all-around shaker and traditional hardwood claves. Each of the pieces is designed to offer a new element to your grooves. They are great for all skill levels and can be played directly out of the box. If you are an amateur artist and you don’t have lots of instruments to play around, and you can’t afford to get expensive instruments such as quality acoustic guitars, this pack is a good start. The Meinl 8” Tour Tambourine features a compact size so that you can play it anywhere. The extra wide grip and the durable ABS plastic frame construction will allow you to use it in any situation.